I actually thought we might be out of the cold for a while. Temps were creeping back up to the point I was able to get multiple outdoor runs with minimal layers. The downside in that it immediately convinces your body that running on a treadmill is beneath it – both metaphorically and literally ha! Apparently it was just a tease being that it snowed this week and temps are hanging in the cold zone. Good news for you, It is still a perfect temperature for birding in my den. 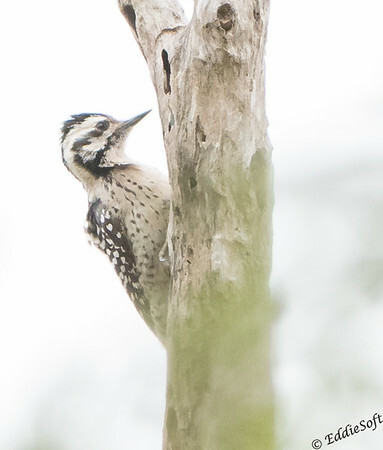 Today’s post happens to come from another one of our Texas birding shoots. 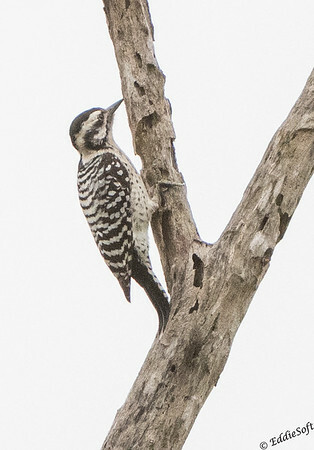 That there is a Ladder-Backed Woodpecker,. which of course prompted my groaner of a title. The Ladder happens to be a +1 for my birding list, but this is not the only new experience I had that day. Should probably start by telling you where we were when Linda and I stumbled on this tree climbing Zebra. On our trip back to Texas over the recent Christmas/New Year’s break, we headed back to our favorite birding spot – the Texas Gulf Coast. This year we added an additional foray west along the southern tip of Texas. One of those places we stopped was near Brownsville, Texas at a place called Sabal Palm Sanctuary. Hit the jump to read more about our visit to Sabal Palm Sanctuary. I had read about this place in a Texas birding book Linda had given me (she really knows how to shop for me). 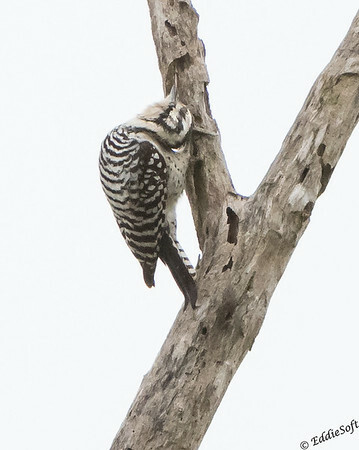 Another one of our friends (Carol) had recently taken a birding trip in that region and noted this place as well. This sanctuary happens to be situated on the Rio Grande River. While driving to the location, we discovered a large structure paralleling the road on our left (East). It didn’t even occur to us for a surprising amount of time that this was a border wall. You would think with all the talk these days, there wasn’t such a thing – which is probably why it didn’t trigger until the wall came in at us, shifted perpendicular to the road and then opened up through a small gap over the road. Took this image from Google Maps. Now that we figured out what it was, our thoughts were quickly replaced with – “Where in the hell is this sanctuary?” As soon as we made it through the intersection we saw a sign that indicated it was further ahead. 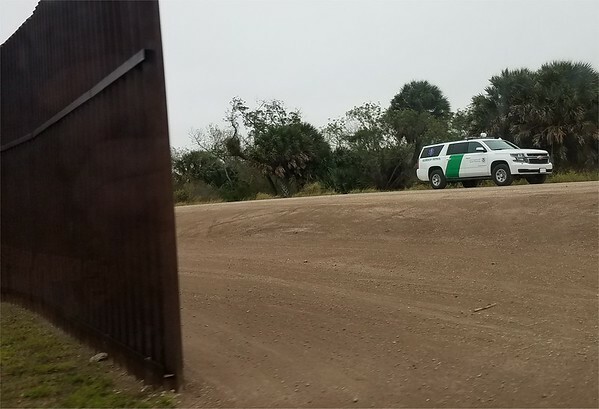 Chalk that up as the first + 1, not only had we experienced a border wall for the first time, we had driven right past it without any security presence in the area. Didn’t seem to be an effective solution at … at the time. After a short drive, we pulled into the completely empty visitor center parking lot. Granted it was New Year’s Eve, but figured there would a few other people there. We made our way to the large mansion that served as the visitor center. While Linda was paying the entrance fee, busied myself checking out the various displays and then stopped in front of a large map of the sanctuary. After orienting myself something jumped out at me. Linda came over and I pointed it out before turning and asking the worker “Does this trail really go directly to the Rio Grande River?” Linda and I looked at each other when the affirmative response came back. Needless to say, we headed directly out to the indicated trail and walked right up to the river. Another first for us – selfies at the Rio Grande hehehe. By the way, having grown up between the Mississippi and the Illinois River, to refer to that as the Great River seems like a bit of a stretch. Having gotten that out of the way, we started making our way back along the trail. As we walked, it had a definite surreal feel to it – there we were, walking alone in the woods next to the border. It was also eerily quiet and there were hardly any birds in the area. Only by luck did I happen to look up at a dead tree and find something clinging to an upper branch. 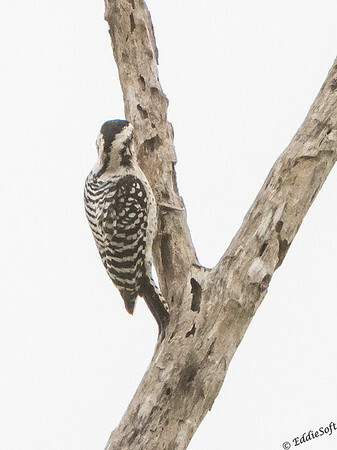 A lot of woodpeckers have made their way into the tin – this one seemed different than all those other experiences. Bigger than a Downy, the lines were fuller and more distinct and the face had cleaner lines than most. She was definitely bound and determined to get whatever bug was trying to take cover in the tree holes. Hard to tell from the reduced size of the shot above, but you can just make out the buff coloring at the base of the bill. You can see it a bit better in the shot below (which is why I left the less than stellar shot in). Unfortunately, there is very little I can relay about this Zebra.. I mean Ladder-Backed. Cornell has really been letting me down lately. 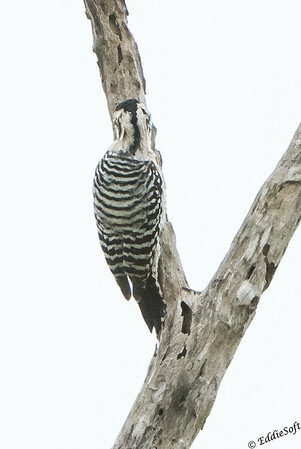 The good news for my brother though is this cactus nesting Woodpecker comes up a little further into the US than most of the birds I’ve been featuring lately. He will still have to travel, but definitely a better chance of adding it to his list. You may recall earlier in the post, I questioned the effectiveness of the border security. Turns out we were NOT alone. As we came back to the break in the wall, we noticed there were eyes on us. Definitely an exciting New Year’s Eve experience with a multitude of firsts. Just in case you are wondering, there will be more posts on their way that feature those white and green vehicles!